3. The challenge is to portray the “essence of species” of your subject while retaining as much of the character of the palm frond as possible. 4. Palm Fronds will be judged on the table. Palm Fronds may be obtained from Daniel Montano, dmontano1@hotmail.com. Visit www.odcca.net for tutorials by Laurie J. McNeil and Daniel Montano. 2. The categories of birds as described in The National Audubon Society, The Sibley Guide to Birds are as follows: Long-legged waders, upland game birds, owls, hawk-like, pigeon-like, tree clinging bird, perching birds, raptors, game bird, shorebirds & miscellaneous. The contest chairman reserves the right to create/delete categories to maximize the number of birds eligible for Best of Show and ribbons in each category. 3. Cocktail bird must be cocktail glass in size. Cocktail birds will be judged at noon on Saturday in the Ballroom. All cocktail birds will become property of the ODCCA and will be auctioned during our live auction Saturday evening. Auction proceeds split 50% to the carver, and 50% to benefit ODCCA. Entries are due to Ms. Lewis by March 1, 2018. Students K thru grades 12 can enter as a group project or as an individual. One entry per person. Each group will be judged 1st, 2nd, and 3rd Best in Group. Entries in the ODCCA contest can be entered in the prestigious 2018 Ward World Carving Championship, April 27, 28, 29 in Ocean City, Maryland. Their age groups at the time of registration are: 16 – 17 years of age; 12 – 15; 11 and under. 1. This year's Red Knot pattern and rules are available on the Ward Museum website at: www.wardmuseum.org. Other patterns may be used. This is for HUNTING STYLE DECOYS that are not fragile and can be carried into the field without fear of breaking bills, tails or primaries. First, Second, and Third Best of Show will be placed in the Saturday night ODCCA Auction and winners will take home 80% of the winning bid and the other 20% goes to benefit the ODCCA. 5. Decoys should fall into one of the three categories: Ground, Branch, or Wire. Ground decoys should be mounted on a detachable dowel and base for display; Branch decoys should be secured to a clip that can be clipped to a branch or wire during hunting; and Wire decoys shall consist of a stiff wire with counter weight for balancing on a branch or wire. Base, dowel (leg), clips or wires with weights are not considered when judging, but should be non-flaring or non-reflective – i.e. neutral in color or match the bird. Regardless of category, all decoys will be judged together with the best three decoys taking the top three honors. 8. Final judging for likeness to species will be done from a minimum distance of twelve feet. 9. IWCA judging procedures and Code of Ethics will be in effect. ODCCA will provide one table for judging. The table will be equipped with a mounted branch for Branch decoy carvings to be attached and a double row of wire stretched across for attaching Wire decoys (a softened barbed wire between fence posts) to simulate natural hunting conditions. Ground decoys will be placed on their base and set on the table. NOTE: Winning birds will be auctioned on Saturday night but must remain on display until 3 p.m. Sunday. 1. Warm-water Game Fish: All Bass, Pike, Muskie, Walleye, Sunfish (bluegill, crappie etc.) and Yellow Perch. 2. Cold-water Game Fish: Brown, Rainbow, Cutthroat, Golden, Lake and Brook Trout, Arctic Char, Dolly Varden, Salmon and Grayling. 3. Additional Fish: All Catfish, Sturgeon, Suckers, Minnows, Gar, Shad, Cisco, and Whitefish. not be given to any disqualified decoys. 2. Only natural wood may be used as a carving material. Wood composites, resins, or other plastics are not permitted. All fins or barbells are to be made from wood or metal. Epoxy or urethane may be used to attach fins or eyes but not molded as a part of the fish. Eyes, screws, display plaques, support structures, and substrate (all pieces of non- created bottom material must be less than 3/8 inch in size) are the only pre-formed material that may be used. 9. NEW: Any fish carving may be drilled if suspected of not being wood. 2. Only natural wood may be used as a carving material. Purpose: The founding fathers of the ODCCA pool contests for Hunting Decoys had one goal in mind. That goal was to create a unique contest that anyone could enter and win regardless of skill level and carving experience. To this end a basic set of rules were established to level the field of competition. The rules stressed simple carving and painting by replicating the color and shape of live Waterfowl. 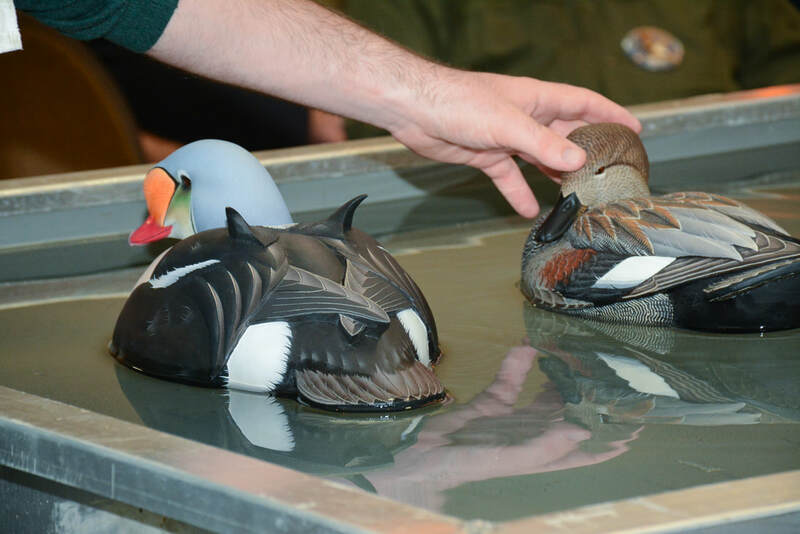 Carvers from all over the country embraced the idea of a contest for basic decoys designed for actual hunting purposes and the “Pool Contests” grew to flagship status for the Ohio show. showcase individual basic gunning decoys in form and paint. 1. Decoys must be made of wood, cork or stretched canvas. No machine duplicated birds or foam will be allowed. 2. Decoys will be judged on simplicity, practicality, and decoying ability. 3. Decoys should be carved in a durable manner to withstand the normal rigors of hunting. No individual feather carving, No carved bill detail. Slight mandible separation will be allowed. ​​4. Decoys must be painted using commonly accepted techniques – brushing, ragging, stippling, combing, scratching, blending and burned cork. Air brushing is permitted. Decoys should be painted in a manner that would allow the average waterfowler to easily touch up and maintain. No feather splits will be allowed. No flocking will be allowed. Judges will be looking for simplicity in paint that best represents the field ID of the specie. 5. Decoys must have a facility for anchor line attachment, and must self right from any position. Geese and Swans must self right when placed on their side. Decoys will be pre-qualified by the pool committee to ensure the rules are followed. Saturday evening 9 p.m. to 10 p.m. in the Board Room, located on the first floor near the hotel lobby. We will register decoys and issue tags, but do not need the decoys until Sunday morning. Sunday morning 7:30 a.m. to 9:15 a.m. in the pool area. Pre-Qualifying: Decoys will be pre-qualified by the pool committee prior to the contest. Carvers wishing to check their decoys for compliance to the rules should present their decoys to the pool committee on Saturday evening at Registration or on Sunday morning poolside prior to registration to avoid forfeiting entry fees upon disqualification from the contest. Entry fees are non-refundable if entry is disqualified after it is registered. 1. Judges will NOT be allowed to touch or handle any decoy before or during judging. 2. Judges will be allowed to move around the pool area as needed. Final judging will be done at a distance. 3. Judges will be instructed to look for the best decoy that incorporates all of the qualities necessary in a TRUE HUNTING DECOY. “KISS” is a good rule to follow when carving and painting. 4. Decoys will be judged by species. 1st, 2nd, and 3rd place birds in each species will receive ribbons. Only 1st place birds of each species will be entered into Best of Category: Puddler, Diver, Goose & Swan, Sea Duck, Coot & Confidence. Only 1st Place decoys in each category will compete for Best of Show. Sea Duck: Eider, Scoter, Long-tailed, and Harlequin will be judged as a group. Goose & Swan: Because of limited entries in this category, all species of geese and swans will be judged together. Coot & Confidence: Because of limited entries in this category, all confidence species will be judged together (Coots, Gallinules, Grebe, Loon and Gull). NOTE: Any decoy that shows paint degradation or damage at any time during the contest or at the conclusion of judging will be immediately disqualified. 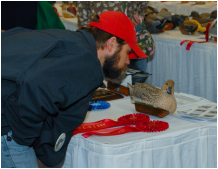 If the decoy in question is in contention for Best of Show, if necessary, Best of Category may be re-judged in order to replace “said” decoy. 1. Rigs must consist of 6 decoys of the same species, and contain at least 2 hens. 2. 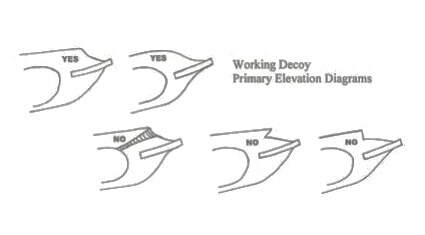 Decoys must be equipped w/12-inch dropper and clip to attach to the mother line. DECOYS MUST FOLLOW THE SAME RULES AS STATED FOR THE SINGLES. Simplicity and the ability to make several for “a rig” will be a point of emphasis for the judges in this division. Pre-registration and pre-qualifying: will follow the same procedure as stated in the Singles Division. Rigs will be judged by category. First, 2nd, and 3rd Best of Category will get ribbons. Categories will be consistent with the Singles Division. Only 1st Place rigs in each category will compete for Best of Show. Best of Show in each age group will receive a carving package donated by the Duck Blind. Must be 17 years or younger on the date of the contest. Rules for the Wildfowlers Youth will be the same as the Wildfowlers, except bird(s) will be judged by age group. Age groups are as follows: 14 to 17, 10 to 13, & 9 and younger. Willy and Di McDonald, The Duck Blind, sponsor this unique contest for gunning decoys. This contest is separate from the Wildfowlers singles contest and for Hens Only. This year we will be judging hens from the Diver Class. The Diver class includes all species of Scaup, Bufflehead, Canvasback, Ring-necked, Redhead, Ruddy, Goldeneye, Hooded Merganser, Common and Red-breasted Merganser. The class will be judged against each other (not by species) following the Wildfowlers Pool Rules. The contest is held on Sunday during the Wildfowlers Contest. Decoys in this contest will not be allowed to cross over to other pool contests. Plaques from the Duck Blind will be awarded for First, Second and Third Place. Entry Fee can be combined with other pool contest fees. $10 for first entry and $5 for each additional entry. 1. This year’s bird is a half-size Tundra Swan. A gesso covered decoy will be supplied. 2.Contestants must furnish all of their own paints, brushes, etc. 1. The bird will be the Sanderling. There will be no entry fee. Each carver will request a blank that will be sent to the carver. There are no rules for carving so you may go all out. You must bring the carving to the contest on Sunday. There will be a limit of 10 blanks sent. 3. Time limit will be 4 hours, Sunday, 9 a.m. to 1 p.m. in the Ballroom. 7. All carvings become property of the ODCCA and will be auctioned Sunday, 1:30 p.m., following the judging. Auction proceeds to benefit ODCCA. Non-winning entries receive 50% split at Sunday Auction. Registration: prior to Sunday 9 a.m., start time on Sunday morning in the Ballroom.